IN HIS huge yellow turban, with his black coat thrown open over his striped blouse and baggy trousers, Nasr-ed-Din Hodja made a bright spot against the mud-brick walls of Ak Shehir. He stood watching the cloud of brown dust rolling along the road that led from the hillside pastures. He hummed the same plaintive tune that the shepherd boy was playing on his wooden flute, a tune that moaned shrill and monotonous above the bleating and baaing of the sheep and goats, above the quick thud of their many hoofs. "Can you pick out your own sheep from the flock?" Ahmet had just joined Nasr-ed-Din Hodja and leaned lazily against the mud-brick wall beside him. "Mine is probably the leader!" The Hodja did not realize that his pride in his lone sheep was the joke of all Ak Shehir. He raised his hand to shade his eyes from the setting sun, the better to identify his precious sheep. "Isn't the leader the plumpest and the whitest of them all?" "If the best animal leads, it must be yours!" There was fun in Ahmet's eye that the Hodja missed. The flocks were now near enough that the men could distinguish the individual sheep. "Oh, my old eyes must be failing me," said the Hodja "The leader is a most ordinary sheep. But do you see that one in the middle of the flock? See how long and curly its wool is! See how white it shines in the light of th setting sun! See how plump it is! That is my sheep." Nasr-ed-Din Hodja shuffled forward and claimed his sheep. He sank one hand caressingly in his pet's thick wool and walked beside it toward home. Ahmet matched his stride to the shorter step of the older man. He had no sheep or goat of his own to lead home. "That is a fine sheep, Hodja Effendi," mused Ahmet. "How plump! How tender! Mash Allah~"
Nasr-ed-Din Hodja cast a suspicious glance at Ahmet who went on as though thinking aloud, "What a shame to have so choice a sheep wasted when the end of the world comes tomorrow!" "The end of the world?" Nasr-ed-Din Hodja stared at Ahmet. "Of course. Hadn't you heard?" Ahmet did not look the Hodja directly in the eye. "If we roasted the sheep soon enough, it would not be wasted when the end of the world comes tomorrow. Oh, well! Of course you would not want to do that!" "No, of course not!" They had now reached Nasr-ed-Din Hodja's gate but the two men lingered while the Hodja asked, "what makes you think the end of the world is coming tomorrow?" "Why, haven't you heard? Everyone is talking about it." Ahmet turned to call to a group of men who were sitting in the fading sunlight by the next gate. "Nasr-ed-Din Hodja has not heard that the end of the world is coming. He does not realize how wise it would be to save this plump sheep by eating it while we are alive to enjoy it." "Oh, that would be the only sensible thing to do," agreed the men, with as gloomy faces as they could manage. Nasr-ed-Din Hodja looked at his fat sheep; waiting patiently for the gate to open and let it into its own courtyard. He looked at the men who were talking so wisely about the end of the world that was coming tomorrow, when sheep, no matter how plump and tender, would be of no use to anyone. Then the Hodja made his great decision. "Meet me at the river bank tomorrow morning," said he. "We'll have a fine meal of roast mutton." With great effort the men kept from laughing until the Hodja was safely inside his own courtyard, with the gate shut behind him. The next day was warm and clear, a perfect day for a picnic at the river's edge. 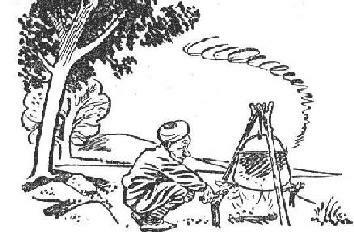 The men invited by Nasr-ed-Din Hodja and many of their friends were there when the first curls of smoke rose from the fire on which the Hodja was to roast the mutton and cook a huge kettle of pilaf - rice pilaf with pistachio nuts. "Our last day in the world," the Hodja was droning. Were the tears he was wiping from his eyes caused by sorrow or by the smoke from the wood fire? "Our last day in this world. Praise be to Allah that it is warm and sunny. If I were not busy roasting this mutton, I would go for one last swim in the river, the cool green river that has comforted us so many years but is so soon to stop flowing." "A good idea," agreed the men. "We can go for a swim while you roast the meat." 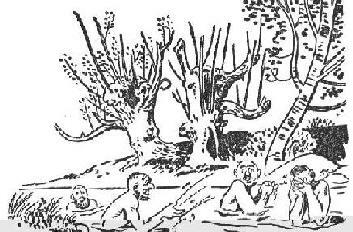 In no time at all their clothes were in a heap beside the busy Hodja and they were splashing in the river. They could not, through the bushes that hemmed the river, see the Hodja, but they could hear the crackle of the fire and the drone of his voice. "Any minute now the end of the world may come. It may be this hour. It may be the next. The end of the world - the end of the world -"
Hearing him moan on about the fate that was ahead, his splashing friends were almost ashamed of their trick. They agreed that, while they were dressing, they would tell him that it was all a prank. Then they could laugh about it together while they ate the feast which their jest had won for them. They hoped he would see what a side-splitting joke it really was. The aroma of the roasting mutton, mixed with a less pleasant smell which they could not identify, was soon more than the hungry men could endure. They climbed, blowing and spraying, out of the river, pushed their way through the scratchy bushes and stood beside Nasr-ed-Din Hodja. They stared, big-eyed, at the grassy bank where they had thrown their clothes. It was as green and empty as it had been when the sun rose that morning. On the fire, burning smudgily, were their clothes. The men stared, open-mouthed but mute, first at the Hodja and then at the charring mass which had once been shoes and coats and pantaloons. The Hodja beamed at them, his smile altogether amiable and guileless. "Oh, about your clothes!" he chirped. "I was cleaning up around here and I realized that, with the end' of the world coming in just a few minutes, you would never be needing them again."